Johanna Brenner: Many activists around the world have been inspired by the Zapatista project of organizing Indigenous communities in Chiapas around the principles of autonomy and participatory democracy. I’m curious to know more about how they are living there, producing and surviving. But first, can you say a bit about where these communities are located and their population? Melissa Forbis: The “Zapatista territory” covers roughly the northeast half of Chiapas (corresponding approximately with the Diocese of San Cristobal). The population there is predominantly Indigenous, but in many places Indigenous and non-Indigenous people live side by side. The Zapatistas have been very successful in organizing autonomous governance, autonomous schools, and autonomous healthcare. Their economic situation has been more difficult to work on. They have some advantages from their location in the countryside where they have been able to take over land and establish autonomous territorial governance. However, they are also embedded as we all are in neo-liberal capitalism—this is the 20 year anniversary of NAFTA, the North American Free Trade Agreement. NAFTA has been devastating for rural people, forcing them to migrate to the larger cities, to the Northern border, and to the U.S. However, the Zapatistas have had some success in taking control over their economy. For example, some areas produce coffee and in the past growers would have to sell to a middle person, who by the way is also called a coyote, just like the person who transports people across borders, for the same reason, because they extort money. Growers did not have access to transport or transport was expensive, they could not verify the quality of the coffee, they couldn’t process it or roast it themselves, and therefore were dependent on the coyotes who set the prices for their crop. The Zapatistas have formed a number of coffee cooperatives who can cut out the coyotes by making links to fair trade coffee export groups primarily in the US, Mexico and Europe. Yet, while taking control of what they produce, and sharing earnings collectively, the cooperatives are still at the whim of the market—for example when there is a glut—and are threatened by other places that produce coffee more cheaply. Zapatista collectives also produce for local consumption, for example there are bread-baking cooperatives, cattle cooperatives, and collective cornfields on lands recovered from wealthy landowners. There are also collective stores that provide local people with lower-cost goods because the collectives purchase in bulk. In addition, community members are saved the cost of travelling to the larger cities in order to shop. Transportation is another arena where I’ve seen innovation. Most Zapatista communities are rural and people rely on buses or trucks to get around. Small companies provide transportation and in a sense they own the routes, setting the price and schedules. After the Zapatistas created the Juntas de Buen Gobierno (Good Governance Councils) in 2003, I think there has been more oversight on whether those private companies are charging fairly and equally. Additionally, there is now Zapatista-owned transportation; those vehicles are also used for other community needs. In spite of the development of these collective projects, many families rely on subsistence farming which is quite uncertain. In the past, the military destroyed crops or people were not able to harvest in time because of the military’s presence. But even without that pressure, there are years when crops fail because of weather or other conditions and the community has to purchase corn at inflated prices. So life remains precarious. One of the other recent efforts to improve economic security in the communities has been the establishment of “popular banks” or revolving funds that make low-interest loans to Zapatista support base members. JB: Could you describe the structure of the Juntas de Bien Gobierno (Good Governance Councils)? MF: The Zapatistas have divided their territory into five regions which they call Caracoles. Within each Caracol there are several autonomous municipalities (the number varies). Each municipality is governed by a council made up of community members nominated to serve for two or three years. Each of the Caracoles has a Junta de Buen Gobierno. These councils are comprised of a rotating group of members who come from all of the autonomous municipalities that correspond to a particular Caracol. There is no standard way that these representatives are chosen – the autonomy is indeed autonomous – but frequently they are people who have served as community authorities, proven themselves, and then been selected to serve at a higher level. There can be a combination of the community naming someone at an assembly, or someone also desiring to serve and making that known. The number of days this group serves on the Junta varies depending on the Caracol. In some they serve 10, in some 14 days. They deal with ongoing and new matters brought before them. When they leave, a new group arrives. Municipal representatives serve as a feedback link between communities and the Junta de Bien Gobierno. For example, in the municipality of 17 de Noviembre, located in the Caracol corresponding to the Morelia region, each community sends men and women as representatives to a municipal assembly. Sometimes issues discussed at the assembly need to be brought forward to the Junta. Or an issue may be sent to the assembly by the Junta who wants the communities to discuss it and report back. Autonomous governance begins at the community level, moving to the municipality level (municipio), then to the Caracol with the Juntas. Decision-making flows back and forth on decisions that are of a movement-level nature or of regional importance. So, there is a lot of consensus decision-making and a lot of consultation with the communities before decisions are taken. Many people from outside would be frustrated because things would seem to move so slowly and you couldn’t get a decision quickly. But, it is because there’s this process of bringing things back to the communities to hear what people have to say, what their ideas are, then bringing it back to an assembly to discuss all of that. Community members who serve in the autonomous governing structures are unpaid, and they rotate frequently so that governance is really a matter of grassroots participation. JB: Earlier you spoke about the Juntas regulating transportation businesses operating in their region. What other sorts of decisions come before the Juntas? MF: Individuals and groups come to the Juntas for a variety of purposes. For example, researchers, like me, are required to present their proposals to the Junta(s) in the region(s) where they plan to do research. The Juntas are also responsible for oversight of income that comes into the Caracol and for projects that are undertaken in their region—for example, the secondary school in Oventik or the sort of post-secondary school in Moisés Gandhi. One of the purposes for forming the Caracoles in 2003 was to make sure it was the Juntas rather than the NGOs and other organizations that were setting development priorities, and to also try to balance the distribution of projects and resources within each Caracol. Since 1994, solidarity groups (national and international) have formed to support the Zapatista struggle and have raised funds to support the movement. Over the years, projects have included health promoter training, education, coffee production, potable water systems, etc. More collective projects have been gradually spreading in the communities, so that these days proportionally more resources are generated internally rather than from outside NGOs and solidarity groups. 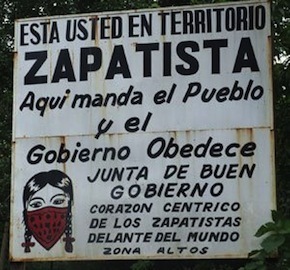 JB: Does the Zapatista organization play any role in this system of autonomous governance? That is as much as I can say, because there is nothing else public that I am aware of. JB: You mentioned increasing migration since NAFTA. I take it the Zapatista communities have not been insulated from those same pressures. MF: No, they haven’t. The Zapatistas have had a policy or they did have the policy up until the last time I talked to someone, that community members wanting to migrate had to first ask for permission. One reason is because the Zapatistas are not only a social movement, they are also still a clandestine movement. But, the greater reason is because participation in the movement requires a commitment to the collective, and absences make it hard to fulfill responsibilities to the community. Generally, people ask to go for a period of time—for three months, six months. And sometimes people don’t come back. But often they do. And there are people who have been able to build a house or use the money for other needs. JB: Does that pose a risk of increasing economic inequality within the community? MF: Well I don’t think people can accumulate large amounts of money in a six-month period. And often, permission is given because of an emergency, such as when a family has built up a large debt from hospital bills or the cost of medicine. JB: So it seems that where the Zapatistas can use volunteer labor—where they can make their own road, so to speak—outside of the neoliberal capitalist system–that is where they’ve built their community. You could say that this is now the heart of the struggle. The Mexican state has moved from low intensity warfare, which was at its highest in the late ‘90s in the region, to what people have called the war of the projects. There is still a paramilitary presence and other kinds of incursions or threats of violence, but the form has changed since the 90s. Now, there is this “war of the projects” in which both the federal and state governments promise aid. Of course people are highly suspicious of these local officials because for decades, this was pretty much what the politicians did—make promises during elections that were never fulfilled afterwards. Now, the cynical way that the government has tried to break the movement is by capitalizing on people’s needs–needs that they helped create in the first place. The government has also shifted from more formally constituted paramilitary forces to offering incentives to competing Indigenous/campesino groups to attack or re-invade Zapatista recovered lands, for example, offering to legalize the land claims of the competing groups. 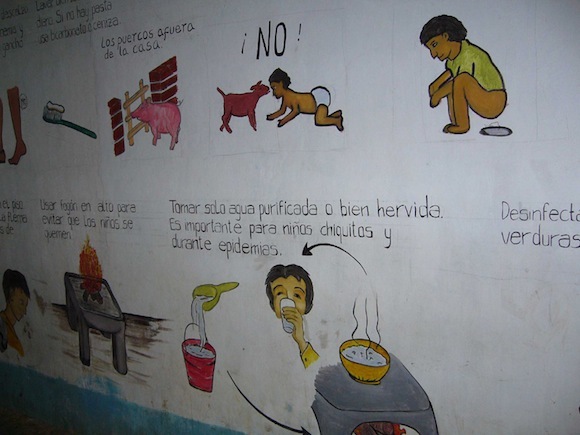 An informative mural in a Zapatista clinic. All of the Caracoles have clinics. In some places, they’re high level clinics with ambulances, dormitories, dentists, doctors, laboratories. In La Garrucha an entire clinic is organized to provide for women’s health with trained midwives and a pharmacy with both western allopathic medicine and traditional healing and herbal medicine. Most communities have health promoters, who receive ongoing training, who provide basic preventative medical care and some of them are trained for quite high level medical care. JB: How do the Zapatistas pay for that? How do they pay the salaries and keep the lights on? MF: The health promoters are all volunteers. This is the case for most of the Zapatista projects. It’s the work that people do as part of their responsibility and obligation to both the movement and the community. This way of thinking does grow out of the Indigenous culture where you are named to a position and you feel a responsibility to do it well for a certain period of time and then other people can be named and if you like it, you could continue and take a higher position. When the community health promoters come to the main clinic, they’ll stay in dormitories there and food is provided for them. Medicines are either free or very, very low cost. And the Caracoles have established a policy that for any project coming in from outside, for example from solidarity collectives, part of the money for that project is put aside to fund the ongoing autonomous elements of the Zapatista movement and is spread around among the autonomous municipalities in the region governed by the Caracol. It is like a tax, or redistribution of income coming into the region. And if the state government wants to build a road through the area, then they need to actually contract with the Zapatista authorities and pay a certain amount too. Typically the contractors for an official government infrastructure project, such as roads or electricity, will negotiate permission with the Junta de Buen Gobierno, in effect recognizing their de facto authority. Education promoters are also supported by the community. The community assembly might come to an agreement to give some food to them or they might help them in their fields when they have to spend time on their assigned tasks or travel to a training. 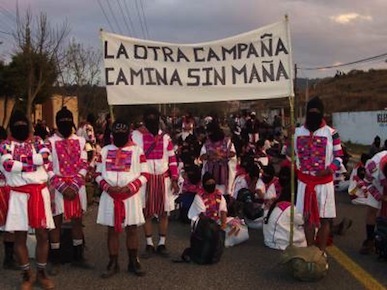 The Zapatistas have tried many different strategies for supporting their autonomous projects. I really want to emphasize that the Zapatista communities are engaged in a process of evaluation and critique and this is one of the most inspiring parts of the movement to me. At the end of every year, there’s an evaluation. Is this working? Is this not working? How could we change it? What are people saying about it? How can we make it better? JB: That leads me to another question: what does it mean to be a Zapatista community? Do the Zapatistas have their own organization separate from this overall communal decision-making process? MF: You know, it really depends on the region and the particular community. So, some communities are mixed. They have Zapatistas, members of other peasant organizations, people who belong to political parties, people who might be Zapatista sympathizers, but not officially Zapatistas. The Zapatistas who are there would have their own meetings, make their own decisions, but wouldn’t necessarily “control” the whole community. In many of the communities that are mixed, there’s a way of living side-by-side that works. There have been conflict in some communities; there’s been violence, not, by the way, started by the Zapatistas, but by people from other groups. But there are also communities that are 100% Zapatista, because they are settled on land that the Zapatista’s have taken over called recuperated lands. The oldest communities in the Lacandon Jungle were settled at the end of the 1920s and into the 1930s when people from different parts of Chiapas began migrating in. Previously there had been plantations, many run by the church, and also by landowners. In the 1940’s and 1950’s people began petitioning the government for title to the land. After the Mexican Revolution it was legally possible for peasants to settle on land that wasn’t being worked and then seek a collective title to work the land as an ejido, or peasant community. The government could also take over lands lying fallow. So, some of the land was national land that belonged to the government, belonged to the Mexican nation, the state, and then others were lands that plantation owners, ranch owners weren’t using. In the years leading up to the uprising, peasant organizations had been forming to demand titles, more land, and services from the government. But one of the major triggers of the uprising was the agrarian counter-reform of 1992. In preparation for NAFTA, the Revolution-era Constitution was amended and land redistribution officially ended, and the collectively managed ejidos could be individually parceled and titled. This was a major blow to poor and landless peasants. Differences within communities reflect political history as well. There was some disagreement about the decision to take up arms; those who opposed the Zapatistas on this have tended to remain outside of their movement, although they might be considered sympathizers. Some Zapatista members decided later to leave, for various reasons, for example, to join up with a political party or other peasant organization. Some left because of need, as when people decided to take government assistance. And some people left because of the kind of struggles we see in every political organization and social movement—power struggles and personal issues between people, conflicting thoughts on the direction of the movement, etc. JB: So in the areas where Zapatistas and non-Zapatistas live side by side, how does governing work? MF: The Caracoles and the Juntas de Bien Gobierno only involve Zapatistas. But their development has definitely been the result of many influences from the different people working with the Zapatistas in these communities, as well as all the people, Mexican and international, who have come to work in solidarity. Indigenous culture has also been a central influence. The Juntas and the Caracoles see themselves as governing their territory—which includes people living there who are not Zapatista members. For example, the transport that runs up and down the road in La Garrucha, is also subject to their authority. I remember a case where bus and truck drivers were charging Guatemalan migrants more money than local people. When the Junta de Buen Gobierno learned of this, they said, “no, you have to charge everyone the same amount of money or you can’t run this route.” And, you know, the Zapatistas do have the presence and the numbers to be able to enforce that kind of thing. Also, community members who are not Zapatistas will come to the Junta de Buen Gobierno to try to resolve matters. They say it’s because that kind of justice is something that they feel is more in line with how they see the world, with their culture, both Indigenous and rural and, the Zapatistas aren’t asking for money, like they would in the official municipality. The Juntas approach decisions by not identifying fault but by trying to reach a compromise that will create more harmony than discord. I think their approach to justice is about an ethic of caring that is quite different from a western model of justice, and the emphasis is on restorative rather than punitive justice. 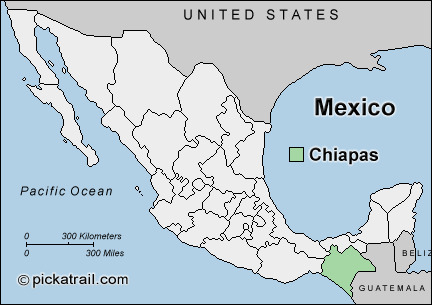 JB: The Zapatistas originally were from outside Chiapas. Now, when you look at, say, a Zapatista community and the people who are setting up the Caracoles and administering and engaging in these decision-making processes, are they people from the area? Have the Zapatistas become Indigenous? MF: Well, only part of the original nucleus of the EZLN were from further north in Mexico. The others were from the area. Before the uprising the Zapatistas had engaged in base organizing in Indigenous communities that had already been mobilizing around land rights and other demands for decades. 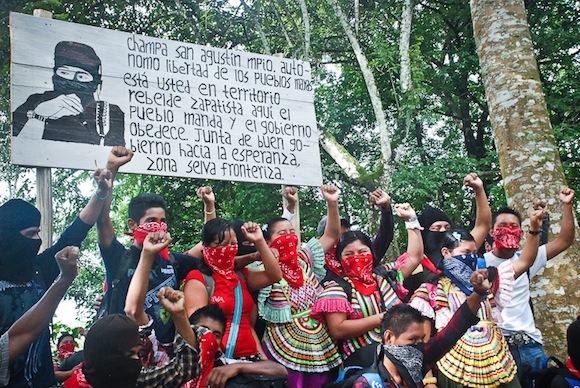 So while not everyone who is a Zapatista is Indigenous, the original small group of non-Indigenous organizers have definitely lived side-by-side with Indigenous people and become part of an Indigenous community. And that’s where Indigenous becomes an identity that people use politically even if it is not a personal identity. JB: So I’m still trying to envision how the Zapatista autonomous bodies of governing, health, education and so on, relate to non-Zapatista members living in their communities. MF: Zapatista clinics treat people who aren’t Zapatistas. And people who aren’t Zapatistas can bring a matter before the Juntas to try to have it resolved. On the other hand, the Zapatista schools that have been set up are exclusively for Zapatista members. There’s a general sense that people have to participate in making these institutions work, i.e. community participation in designing the curriculum of the autonomous schools, if they want to benefit from them. 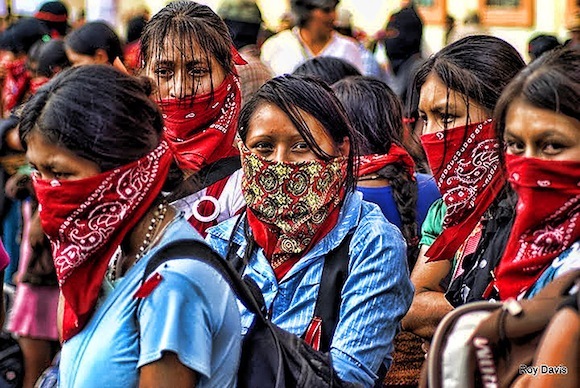 JB: Let’s talk about the gender politics of the Zapatista project. What is your assessment of how older patterns of participation and leadership are being challenged or changed? MF: Well I think people are aware that women were very present from the beginning and took on leadership roles in the insurrection and then as military leaders. This is notably different from the history of the Sandinistas and the post-Somoza Sandinista government. I teach a class called Gender and Social Movements in Latin America and I assign “The Country Under My Skin” by Gioconda Belli, which gives a clear sense of what it was like for a woman to participate in that revolution. The Sandinistas did not include the idea of ending gender and racial oppression from the beginning and that led to considerable disappointment of women and Afro-Nicaraguans once the Sandinistas came to power in 1979. From the beginning, the Zapatistas emphasized gender equity, as well as the rights of Indigenous people, the rights of peasants, and so on. On the leadership level there have always been women insurgents, large numbers of them, and some in military leadership positions. On the civilian side, there are women who are health and education promoters, political authorities, members of autonomous municipal councils and Juntas de Buen Gobierno. You see fewer women playing roles as authorities at the community level. One reason is patriarchy, which is just still present. Another is land titles, which give people rights as ejidal members. Women actually do work the land alongside men, although men do more of the work in the fields. Yet there is a persistent belief that women don’t really work the land and so don’t have a right to it. Over the past ten years, Zapatista women have been increasingly raising the idea that they should have rights to the land. What gender equity looks like is very specific to Indigenous women in the communities. 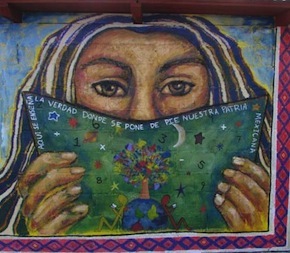 I like to point out that the Zapatista Revolutionary Law of Women, which went into effect in 1993, even before the uprising, included, alongside the rights we would recognize, like the right to control how many children one has, the right to not be forced to marry, the right to education, is the right to participate in the community. I think this right relates to Indigenous ideas that center on the responsibility individuals have to work on behalf of the community. It’s different from the right to be a leader—which the Law also established. The right to participate comes out of an understanding of a self that is always part of a collective struggle. So to be denied the right to participate equally is to be cut off from being part of the movement in the same way that men are. A colleague and I are writing a paper looking at Indigenous women’s theorizing and then reflecting back on our own Northern feminism and ideas of citizenship and the challenge to it represented by Indigenous women’s approach. One of the key things that Indigenous women emphasize is that this is not just a struggle for women and they say that it’s always, always simultaneously a struggle for their people, for themselves as an Indigenous people. Women’s organizing will always have that collective component within it, even as they might be also demanding individual rights. Outsiders coming to the communities often say it looks like women are still oppressed, because they’re taking care of children or are doing domestic work. Indigenous women are making a more subtle point. They will say yes, men need to help out in the domestic sphere, just as we help out in the fields. But they also say we should not value one kind of work as more important to people’s survival, contentment and happiness than another. They also view all people as inherently capable of doing all of these kinds of work. It’s hard, make no mistake. Being a Zapatista, you may be poorer than other people in monetary terms, because you’re not accessing income from government programs. At the same time, there’s a sense of worth. There’s a sense of struggle, of having built something with other people that has been very empowering. JB: You’ve described how the Zapatistas are going very deep, developing their autonomy on that land base and for the long-term. They clearly are very interconnected globally and continue to inspire support. I’m curious about their interconnections to organizing in Mexico. I know of one such relationship—with the Coalition for Justice in the Maquiladoras. The two organizations engaged in a series of “encuentros” where Zapatistas came up to Blanca Navidad, an illegal settlement near the Mexico-U.S. border, organized by maquiladora workers, and then some of the community activists travelled down to Chiapas. MF: As it happened, I was at the meetings in Blanca Navidad. My sense is that this connection between the two organizations was one of the outcomes of the Zapatistas’ “Otra Campaña” (Other Campaign), in which a Zapatista delegation travelled throughout Mexico during the national election campaign in 2006. Their goal was to make connections with grassroots organizing projects and to pose an alternative to people passively electing politicians to “represent” them. My sense of the Other Campaign is that they were most successful at the northern border, California through Texas. Blanca Navidad was one of those places. I think it is important to say that these meetings were a real dialogue. People in Blanca Navidad were inspired by the Zapatistas, but they had also been developing their own ways of organizing and their own ideas of building community; so there was a real dialogue. Despite the fact that the “Other Campaign” did not have the results the Zapatistas had hoped for, which mirrors some of their earlier attempts to reach out to the so-called Mexican civil society, their example continues to inspire people throughout Mexico, as evidenced by the huge response to the invitation to participate in the Escuelita beginning in August 2013. Indigenous communities and areas continue to declare themselves autonomous and are organizing themselves in their own ways. JB: An interesting contrast with the global connections that the Zapatistas have built. MF: You know, one global connection I can think of right now that has been important is this question of alternative and social media that I think is something to reflect on with the 20 years of Zapatismo. The Zapatista struggle coincided really with the advent of the internet or at least the popularity of the internet and that it was a tool in the hands of activists. Some have called the Zapatistas the first post-modern guerrilla. Calling a large group of people who are peasants post-modern does not quite capture their daily lives and struggles! At the same time, the Zapatistas’ ability to use that tool for activism was important in shaping the struggle there—in terms of the incredible global solidarity and support they continue to receive– but also in the way that the Zapatista uprising was able to inspire people—for example, the organizing against the World Trade Organization in Seattle in 1999. JB: Inspiring, yes. But on the other hand, there is a difference between the virtual world and the actual world of ongoing connections to each other. Does the Zapatista presence on the web, expressed through its communiques and reports, fully reflect reality on the ground? Does something important get lost? MF: That is an interesting point. What inspires me about the Zapatistas is the day-to-day complicated work, often conflictive work of living autonomy and putting it into practice. The communiques don’t always reflect the complexity of life in the communities. Yet it is from those hard, conflictive moments—and how people deal with them—that we have the most to learn. Melissa Forbis is a member of the Department of Cultural Analysis and Theory faculty at Stony Brook. She has been doing community work and research in Zapatista communities since 1996. Several articles on women in Chiapas and her Ph.D. Dissertation, “Never Again a Mexico Without Us: Gender, Indigenous Autonomy and Multiculturalism in Neo-Liberal Mexico,” are based on that research. She is currently completing her book manuscript based on the dissertation and subsequent research. On the occasion of the 20th Anniversary of the Zapatista uprising, she was interviewed by Johanna Brenner, a community activist in Portland, OR and an Advisory Editor of Against the Current.